Update: Crossroads Tabletop Tavern is opening on Thursday, August 30 at 6 p.m. It will soon be game night every night in the heart of Manassas, if all goes according to plan. Crossroads Tabletop Tavern, a business that could be opening in the coming weeks, will offer a unique opportunity for community members to socialize. “Here, you get to come in and sit down and pick from over 1,400 games on the wall, dating as far back as the early 1900s and including a lot of current games,” Owner John Hornberger said. It also offers a various food items and beverages. The business idea stems from an activity Hornberger enjoyed when he was growing up — game night. “Friends and family [would] come over, we’d stay up until the wee hours and play … all sorts of games,” Hornberger said. 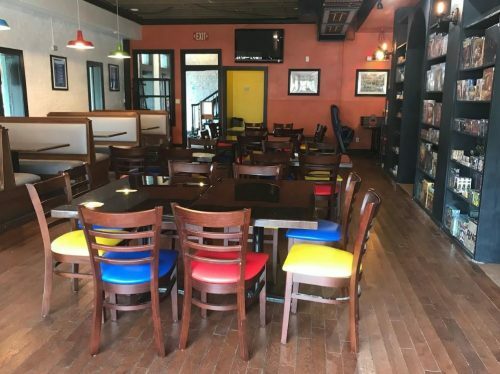 Crossroads Tabletop Tavern will operate out of a facility located near the train tracks and parking garage in downtown Manassas. The building, which is believed to have been built in the early 1900s, has served as a dentist office, a bank, and most recently — a bar. But becoming “another bar” isn’t the intention, according to General Manager Jesse Farmer. Crossroads Tabletop Tavern also seeks to be inclusive of all community members. “We really think that this is good for people, no matter where they are in life — whether they’re working hard 9 to 5 or they have hobbies already and they look at us as a hobby shop,” Farmer said. The tavern’s location allows community members to play board games at their leisure.